After Mexico, Spain Spree: Visit the beautiful city of Valencia! The beauty of Spain is discovered during a trip in Valencia. This is the 3rd largest city in Spain after Madrid and Barcelona. It is a must-visit destination for a holiday for those who want new experiences. Tourists can start their stay by visiting the famous City of Arts and Sciences. This ultra-modern complex is located on the outskirts of downtown. 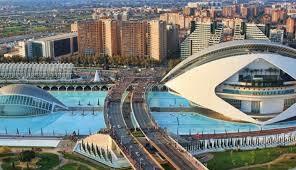 It was built by Valencian architect Santiago Calatrava. This masterpiece occupies an area of ​​350,000 m² and includes several buildings, which are the most visited L’Hemisfèric and Science Museum. Vacationers will also find the Queen Sofía Palace of Arts, the Umbracle, the Agora or the Bridge of the Golden Assut. And among the “can’t miss destinations” in the City of Arts and Sciences, is the Oceanogràfic which is one of the largest aquariums in Europe. It includes more than 45,000 copies of 500 different species, such as sharks, sea lions, penguins, dolphins, walruses and beluga whales. In short, the City of Arts and Sciences is one of the centers of interest not to be missed during a visit to Valencia. The discovery of Valencia then continues to the natural park of the Albufera. This site is located 15 km south of the city. It has an area of ​​nearly 21,000 hectares and is home to one of the largest lakes in the Iberian Peninsula, Lake Albufera. This park has great ecological interest, because here several species of water birds, such as wild ducks and herons, come to spend the winter. In 1990,this place was on the list of wetlands of international importance. A visit to the nature reserve can be done in many ways: on foot or by bike. However, the Albufera tourist bus remains the least tiring option and the most complete. Indeed, this bus will take backpackers into the heart of the Natural Park of Albufera. In addition, the ticket costs about 30 € including a boat ride of 30 minutes on the Albufera. The park tour lasts approximately 2 hours and will offer backpackers the opportunity to enjoy a rich ecosystem. Moreover, the Albufera lake separated from the Mediterranean by Devesa del Saler. It is a thin strip of land embellished with pine forests and dunes. Here tourists can swim and laze on a beach with fine pristine white sand.